Never know the discomfort of constipation again – and without any laxatives or purging medication. Psyllium will gently ensure bowel movements while fenugreek will assist digestion – and can be taken on a continuous basis. 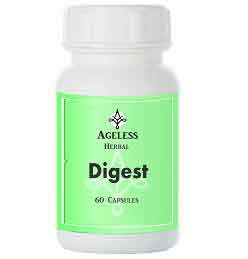 Our Herbal Digest Capsules are the answer to all those suffering from a sluggish colon and chronic constipation. The psyllium used is NOT a laxative and will neither stimulate nor irritate your colon. Psyllium is a natural bulking and hydrating agent that will ensure regular and soft bowel movements and since it is not a laxative it can be used continuously. The fenugreek combined in this capsule is also a digestive tonic which will further help to get your digestive system working the way it should. Taking laxatives daily or at regular intervals is not a healthy way to keep regular, but the side effects of constipation are just as bad. To remedy this situation we developed our Herbal Digest Capsules, which keeps you regular but without having the side effects of other laxatives. Psyllium is a bulking agent and keeps moisture within the colon, ensuring that the colon keeps on moving and that constipation does not occur. We added fenugreek – this herb is a wonderful digestive tonic and helps digestion along. Although we packed psyllium in capsule form, people can also buy it in bulk form from their health store. It forms a gelatinous mass when mixed with water and some people prefer to take our capsules – which is a far easier way of taking this very humble, yet very effective remedy for constipation. There is no hi-tech in this capsule. This capsule solely relies on the capacity of psyllium to keep feces moist and prevent constipation mixed together with fenugreek to maximize your digestion and to help prevent any digestive upset. Thousands of people have found relief from chronic constipation this natural way and we hope that if you have this problem that we can help you with this uncomfortable problem that can negatively impact on your health. Our Herbal Digest Capsules have an unique and extraordinary formula in which a blend of various pure herbs and natural ingredients are combined to create this remarkable product. It contains the following herbs and natural ingredients: psyllium and fenugreek. Take one to two capsules daily an hour after your main meal with a full glass of water. No toxicity has been reported. Considered safe when used in recommended dosages with adequate fluid intake. Do not use when on digitalis medication or if you suffer from an intestinal obstruction, disorder of the esophagus or are an unstable diabetic. Some people with Irritable Bowel Syndrome may experience an aggravation of symptoms. If no relief from chronic constipation is achieved please consult a medical practitioner. Natural solution for constipation and helps colon health. Helps to keep the bowels regular and acts as a tonic on the digestive system. Does not irritate the stomach or colon and easy to take since it is in capsule form.